My grandfather loved Pebble Beach and I loved the stories he often told me about his annual visits to the Bing Crosby Clam Bakes (now the AT&T Pebble Beach National Pro-Am). The rolling greens and rugged coastline, the mingling with celebrities, friends, and golf lovers, and the parties – oh the parties – all sounded so wonderful to me at 12-years-old, an age when girls begin daydreaming about famous folks and adventures in far-off lands. 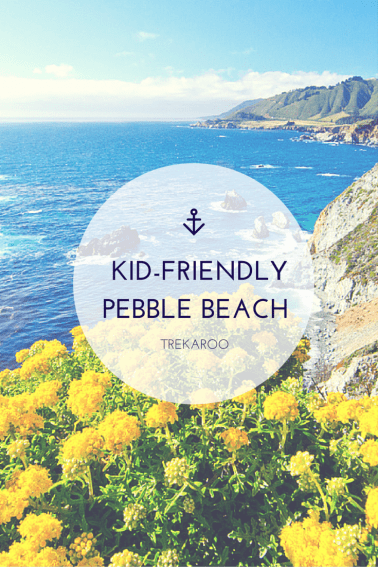 “Oh Darling, Pebble Beach isn’t for kids!” he’d exclaim before declaring that I’d be bored there. If he were still with us, my grandfather might be surprised to learn that Pebble Beach isn’t just for grownups like he thought! Families are now discovering this historic top golf course thanks to the Pebble Beach Explorers Program. The family travel package includes one night stay at the Inn at Spanish Bay, a welcome Scavenger Hunt, complimentary meals at Roy’s, and STICKS dining for kiddos 12 and under with a paying adult. Kids even get in on the activities with free golf, tennis, and horseback riding. 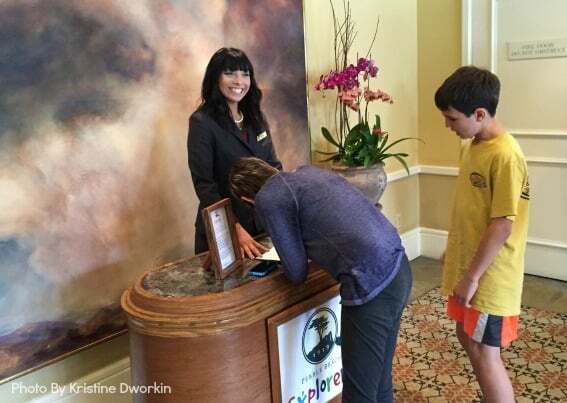 Little Explorers start their stay at The Inn at Spanish Bay by checking into their own special front desk and signing in, much like they’ve seen their parents do when checking into a resort. They receive special lime green bracelets identifying them as explorers and entitling them to all of the program benefits. To kick off the fun to be had over the course of the visit, young explorers are invited to participate in a scavenger hunt that could result in some fun prizes. Let me say that these are the best grounds for kids to scavenge on! 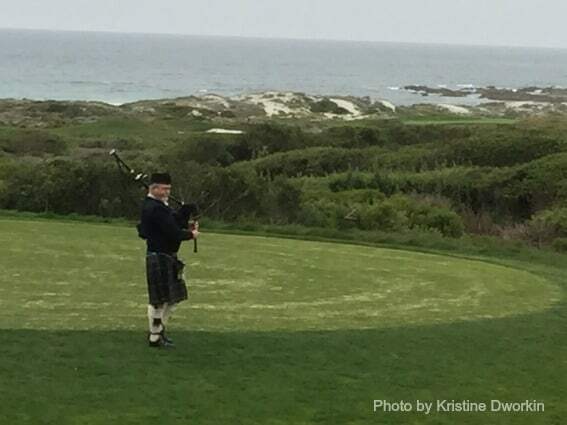 Nestled on a pristine coastline overlooking the Pacific Ocean, The Inn at Spanish Bay is partially protected from the ocean’s winds by the forest of Monterey pines. The Scottish-style golf course surrounding the Inn rolls out like a carefully placed, lush green carpet so as to not disturb the fragile habitat next to it. My kids were delighted by the sight of small rabbits darting in and out of the sandy landscape. Rooms at this cozy and contemporary 269-room accommodation are stylish and comfortable. They include a sitting area with a fireplace as well as a private patio with breathtaking views of landscaped grounds, forests, fairways, and the magnificent Pacific Ocean. Whether your intent is to play golf on one of Pebble Beach’s world-famous courses, ride at the equestrian center, or go beachcombing while hoping to spot whales in the ocean, there is so much here to explore and enjoy as a family. When headed out to Peter Hay Golf Course, a 9-hole par-3 course open to the public to swing the irons, my son looked confused as he scanned the course. “Where’s the castle? Where’s the Dragon’s Head?” he asked. “This is real golf,” my daughter told him with indignation in a voice reserved for annoying younger brothers. “Oh, like Tiger Woods would play on!” he exclaimed. 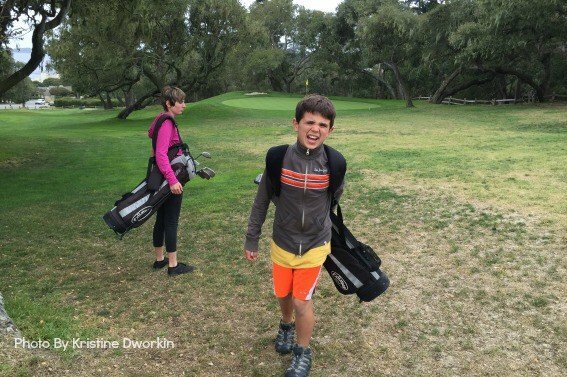 Located across the street from Pebble Beach Golf Links, we spotted many parent-child pairs out on the course, clubs slung over shoulders, concentration called up, and game faces on. Each child was issued their own set of kid-sized clubs at the course kiosk. The minute they positioned the strap of the bag on their shoulder, a serious look came over them. What is it about golf that brings out such intensity? 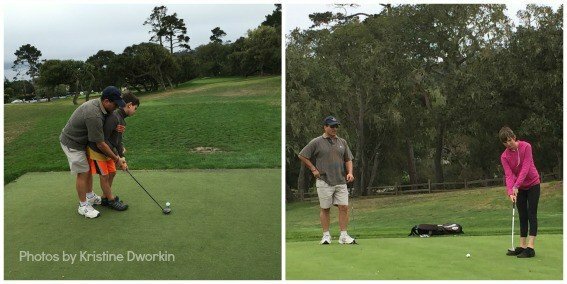 Peter Hay, which was named for a longtime Pebble Beach golf professional, turned out to be a great course for our kids to try their hands at “real golf.” Just like amateur golfers, they contended with sand traps, often hitting into the rough. They learned to pay attention to other players and their wayward balls, and they even learned to overcome the frustration of bad swings. It was fun to watch my husband teach them. Sometimes they took in his instruction, sometimes they did not. In the end though, at least one of them wiped the course with her parents! 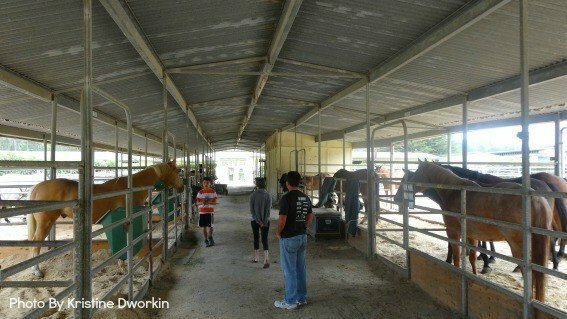 It is my understanding that many of the horses in the Pebble Beach Equestrian Center were rescued from unfortunate situations. They are certainly in an idyllic place now! There are more than 30 miles of riding trails available to visitors. Some of them traverse the Pacific coastline while others take riders through the Del Monte Forest. Visitors do not need to sign up for a ride in order to come for a visit however. The horses love visitors and guests are welcome to come brush these beautiful animals and feed them carrots anytime they wish. 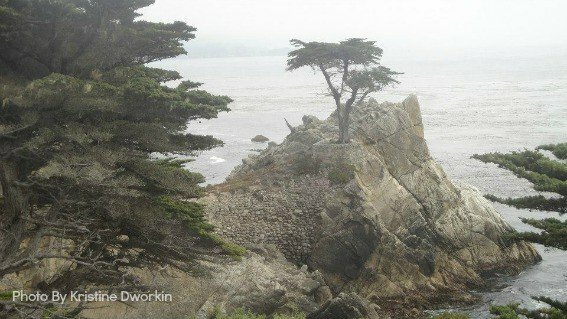 Stunningly beautiful scenery, mansions, Cypress trees, and rugged rock formations are among the sights visitors will take in on the amazing 17-Mile Drive. 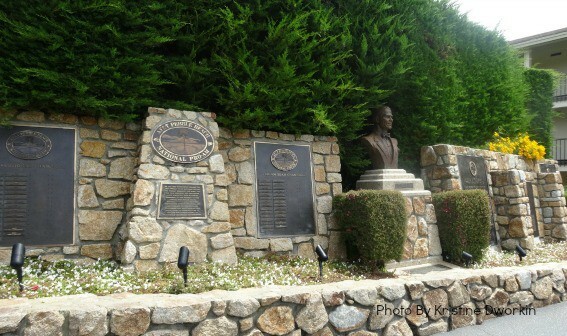 Meandering through Pacific Grove and Pebble Beach, much of it hugs the coastline passing through scenic attractions like the Lone Cypress, Bird Rock, and the 5,300-acre Del Monte Forest of Monterey Cypress trees. My kids’ favorite stop was the Ghost Tree. Both of my kids preferred to spin a spookier story behind how it got its name rather than believe that the ocean wind could bleach a Cypress tree! At meal time, it’s particularly important that little explorers slip on those bright green bracelets issued to them at check-in because as part of the Pebble Beach Explorers program, kids 12 and under eat free at STICKS and Roy’s. Overlooking the beautiful links of Spanish Bay, STICKS serves up classic American fare that kids love. Seriously, what kid isn’t going to try to convince their folks to order the tater tot appetizer? They also serve up a parent-approved kids meal; this parent approves anyway! My son’s order of spaghetti and meatballs was delivered to the table in a bento box-style tray that included celery, asparagus, carrots with ranch dressing, and a fruit medley. Much to my surprise he ate most of it! For dessert we ordered what my kids deemed the best treat ever! It was a cookie skillet – a family-sized chocolate chip cookie drizzled in caramel, ice cream, and topped with whipped cream and served in a cast iron skillet. The links outside the restaurant are a nod to an old Scottish word for sandy wasteland with bristly grass and prevailing wind. Links are almost always near the sea. This could be why a bag piper appears near the patio at dusk. He fits so authentically into the landscape; the haunting roll of the instrument’s tones reaching out over the grass may even make you momentarily think you’ve found your way to Scotland. If Roy’s and Hawaiian-fusion sound familiar, than perhaps you’ve visited one of the chain’s high-end locations in the Hawaiian Islands. My kids not only enjoyed their lunch, but appreciated the openness of the decor. They could see what was going on in the kitchen, but also enjoyed the panoramic window view of Pebble Beach where small rabbits appeared and disappeared into the landscape. This left them with lots to observe and talk about while devouring their teriyaki chicken bento boxes. I may have never made it to Pebble Beach with my grandfather, but I felt his presence as I showed my kids historic markers, passed along stories about Bing Crosby’s Clam Bakes and the famous golfers, many of whom made their name here. I imagined him walking the pathway up to the Pebble Beach Greens adjacent to the resort’s grand Lodge where we watched caddies greet groups of golfers. I also wondered what he would have thought as my husband patiently attempted to teach his family the game of golf. I’d like to think that I did a decent job of passing down an appreciation for this gem of a resort that he held in such high esteem. Perhaps my daughter’s announcement that she would like to take golf lessons is a good start! 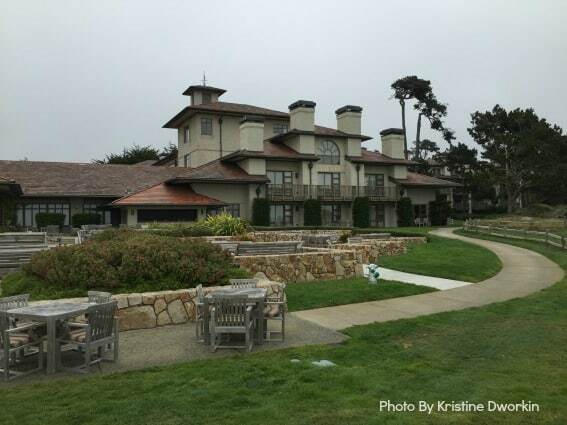 Want more kid-friendly fun on the Monterey Peninsula? Check out these reviews. Disclosure: Thank you to Pebble Beach Resorts for hosting my family. Although we received discounted lodging along with complimentary dining and activities, my reviews are always my own opinions and are not influenced by staff or its affiliates.